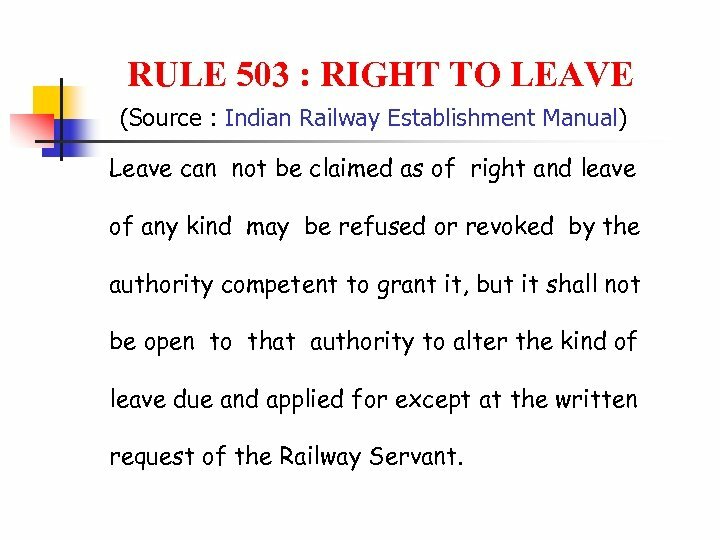 RULE 503 : RIGHT TO LEAVE (Source : Indian Railway Establishment Manual) Leave can not be claimed as of right and leave of any kind may be refused or revoked by the authority competent to grant it, but it shall not be open to that authority to alter the kind of leave due and applied for except at the written request of the Railway Servant. 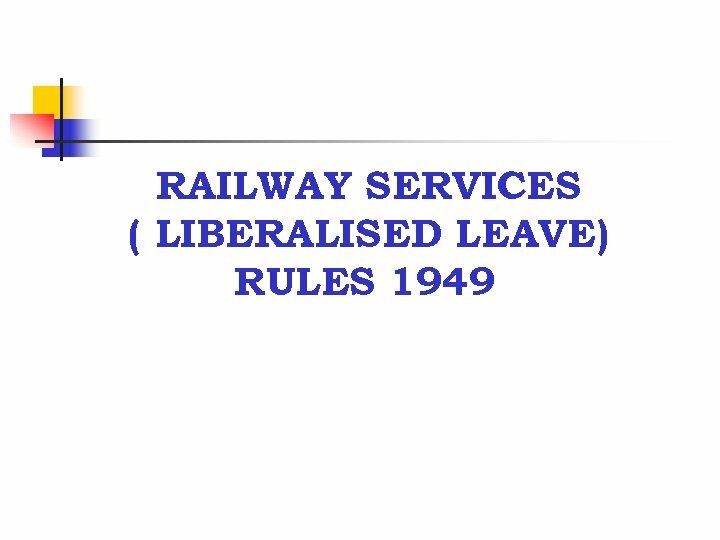 Railway Services (Liberalised Leave) Rule, 1949 Special leave Study Leave Max. 24 Months, 12 Months at a Time. For Doctors up to 36 months for PG After 5 yrs. Regular Service & 2 sureties To serve for Min. 3 yrs. On return. Extra Ordinary Leave Child Care Leave 3 Months W/O M/C 6 Months with M/C 18 Months with M/C. For treatment of Cancer Max. 2 years (730 Days) During entire Service 24 Months for Prosecuting higher studies with 3 years Reg. Service & 2 sureties For 2 child Up to 18 years To serve for Min. 3 yrs. on return. of age CCL only when No APL at Credit. 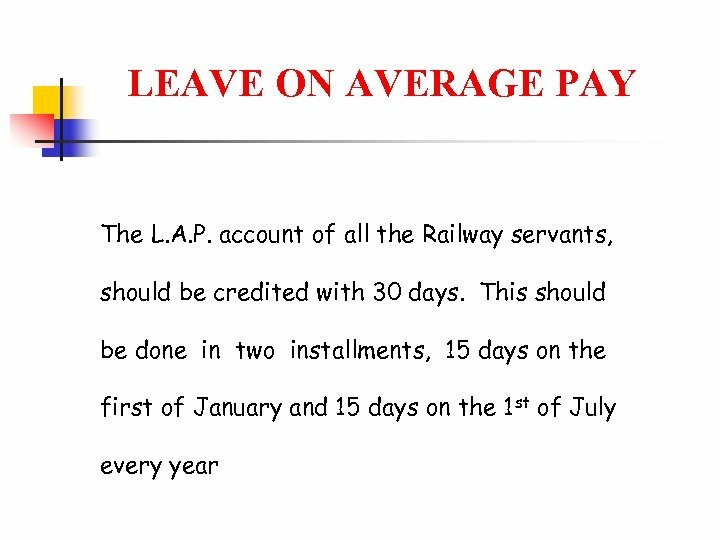 To be reduced by 1/10 th of the period of extraordinary leave availed during the previous half year, subject to a maximum of 15 days. Joining in between : 2. 5 days for one month Maximum limit for accumulation of LAP 300 days. 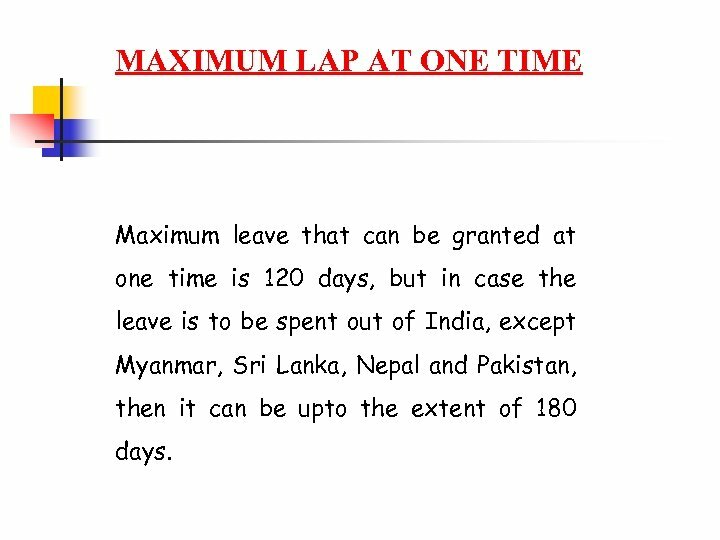 MAXIMUM LAP AT ONE TIME Maximum leave that can be granted at one time is 120 days, but in case the leave is to be spent out of India, except Myanmar, Sri Lanka, Nepal and Pakistan, then it can be upto the extent of 180 days. 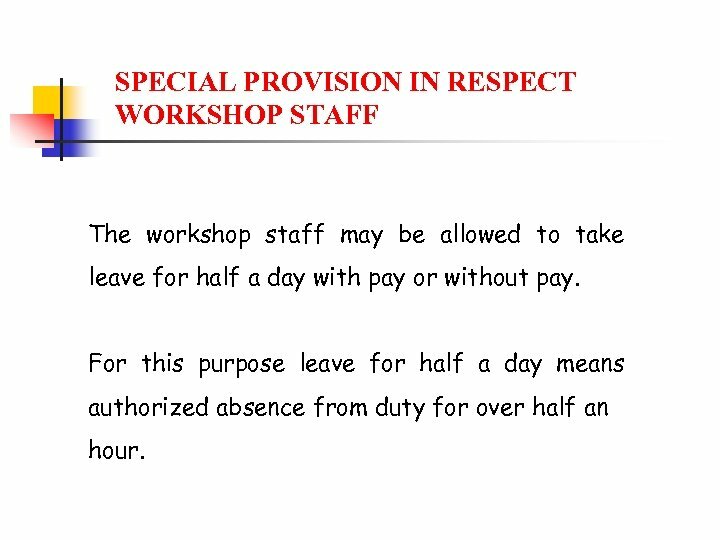 SPECIAL PROVISION IN RESPECT WORKSHOP STAFF The workshop staff may be allowed to take leave for half a day with pay or without pay. 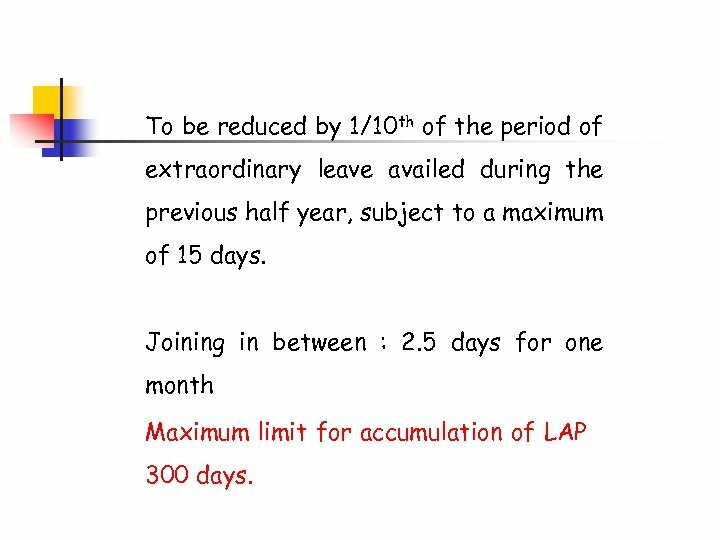 For this purpose leave for half a day means authorized absence from duty for over half an hour. 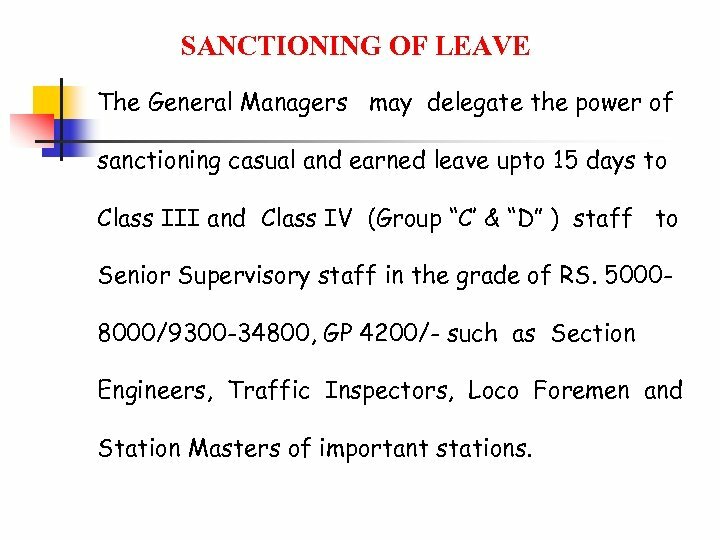 SANCTIONING OF LEAVE The General Managers may delegate the power of sanctioning casual and earned leave upto 15 days to Class III and Class IV (Group “C’ & “D” ) staff to Senior Supervisory staff in the grade of RS. 50008000/9300 -34800, GP 4200/- such as Section Engineers, Traffic Inspectors, Loco Foremen and Station Masters of important stations. 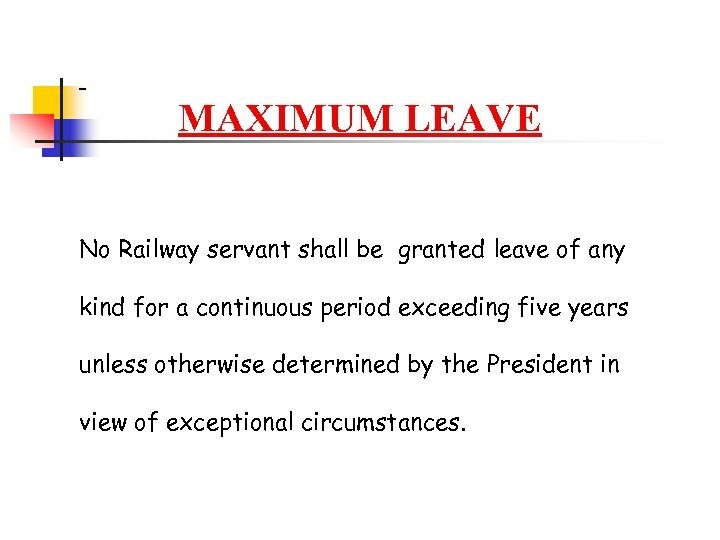 MAXIMUM LEAVE No Railway servant shall be granted leave of any kind for a continuous period exceeding five years unless otherwise determined by the President in view of exceptional circumstances. 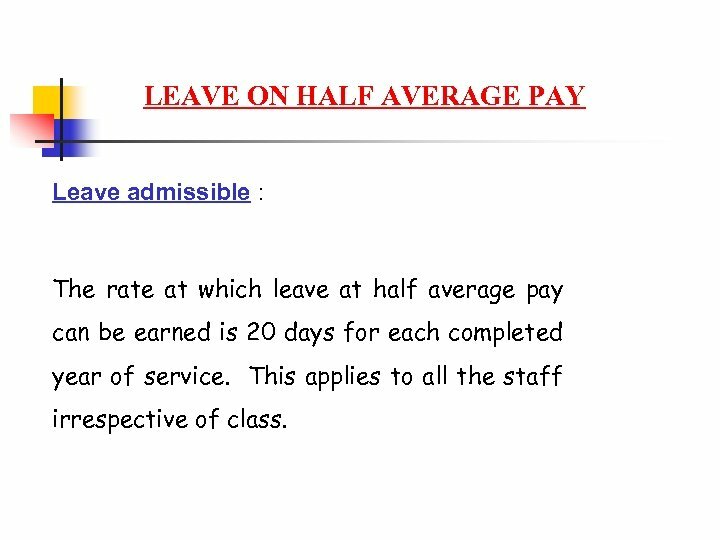 LEAVE ON HALF AVERAGE PAY Leave admissible : The rate at which leave at half average pay can be earned is 20 days for each completed year of service. This applies to all the staff irrespective of class. 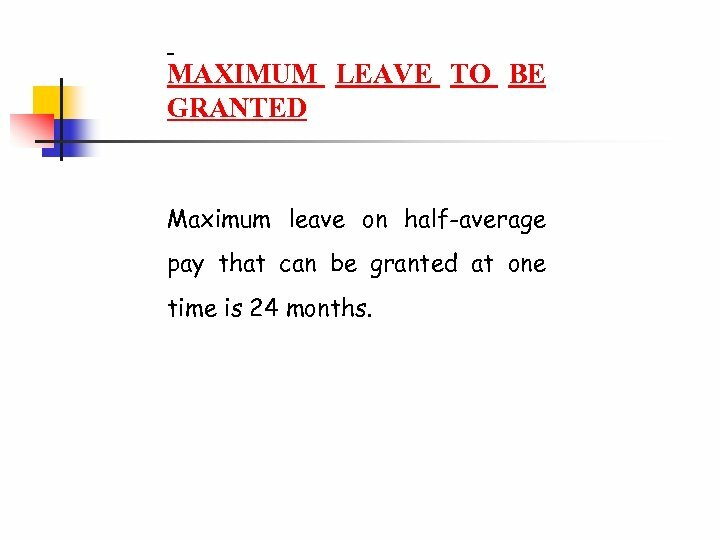 MAXIMUM LEAVE TO BE GRANTED Maximum leave on half-average pay that can be granted at one time is 24 months. 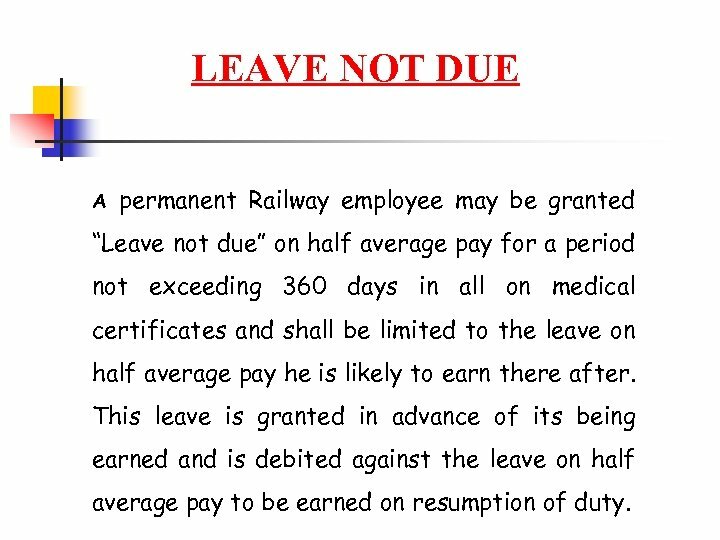 LEAVE NOT DUE A permanent Railway employee may be granted “Leave not due” on half average pay for a period not exceeding 360 days in all on medical certificates and shall be limited to the leave on half average pay he is likely to earn there after. 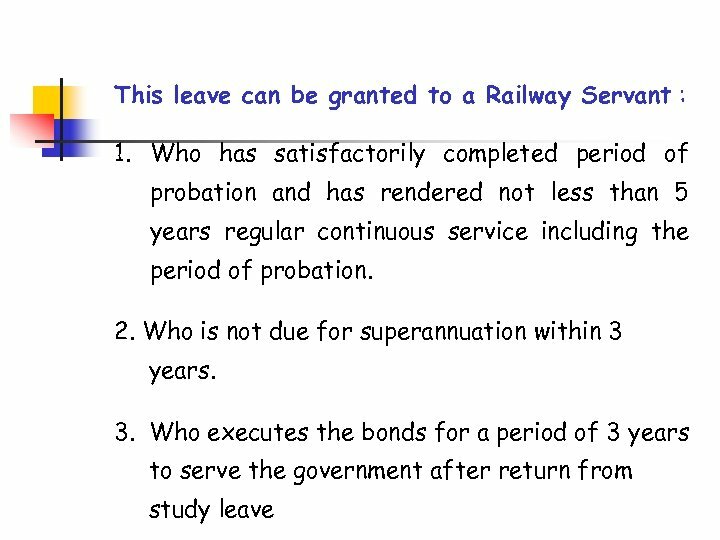 This leave is granted in advance of its being earned and is debited against the leave on half average pay to be earned on resumption of duty. MATERNITY LEAVE (Rly. Bd. No. RBE No. 158 dtd. 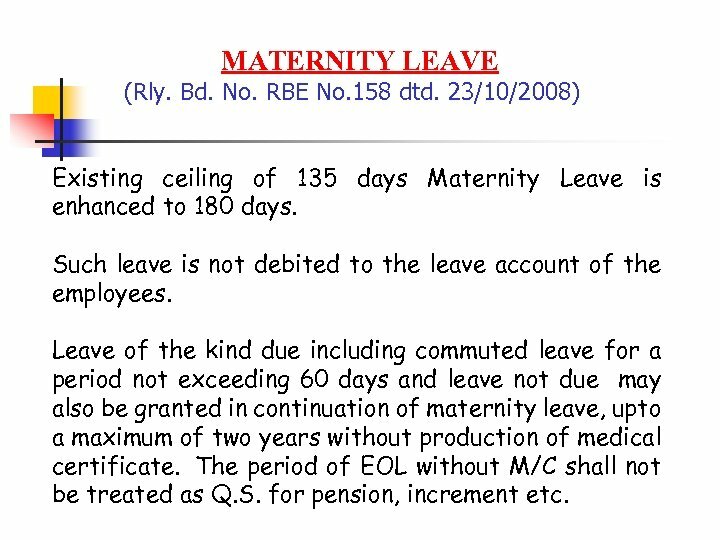 23/10/2008) Existing ceiling of 135 days Maternity Leave is enhanced to 180 days. Such leave is not debited to the leave account of the employees. 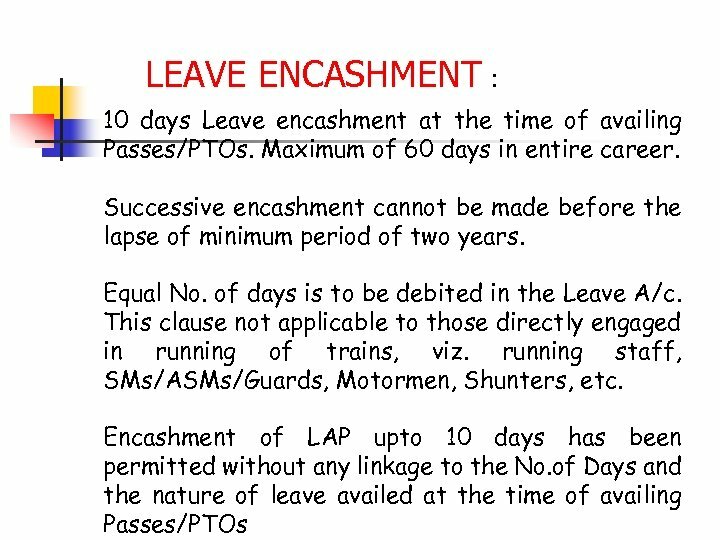 Leave of the kind due including commuted leave for a period not exceeding 60 days and leave not due may also be granted in continuation of maternity leave, upto a maximum of two years without production of medical certificate. The period of EOL without M/C shall not be treated as Q. S. for pension, increment etc. CHILD CARE LEAVE RBE No. 144/2010 issued under L. No. E(P&A)I 2008/CPC/LE-8 dated 4. 10. 2010. ) 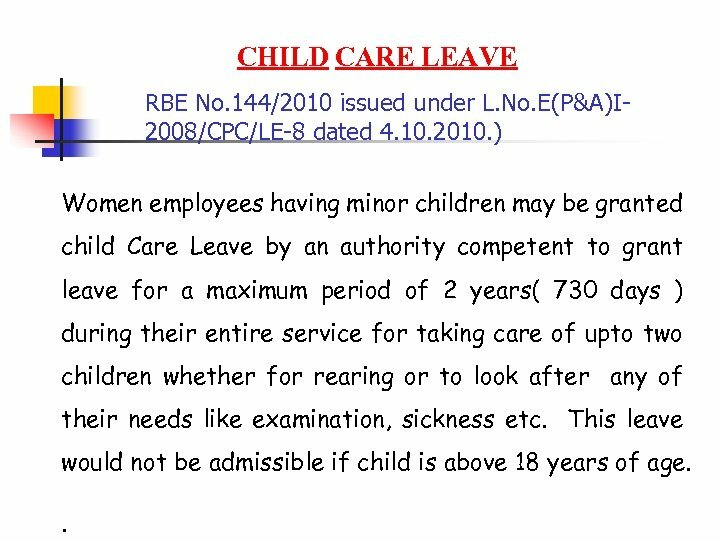 Women employees having minor children may be granted child Care Leave by an authority competent to grant leave for a maximum period of 2 years( 730 days ) during their entire service for taking care of upto two children whether for rearing or to look after any of their needs like examination, sickness etc. This leave would not be admissible if child is above 18 years of age. .
CHILD CARE LEAVE This leave shall not be debited against the leave account. 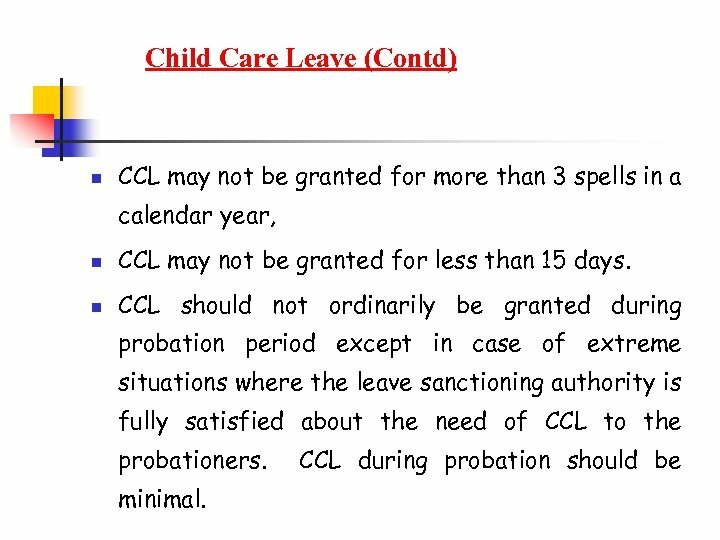 During the period of leave the women employees shall be paid leave salary equal to the pay drawn immediately before proceeding on leave CCL cannot be demanded as a matter of right & an employee can not proceed on CCL without prior approval. CCL can be availed only if the employee has no Earned Leave at her credit has been modified recently and has since been deleted. 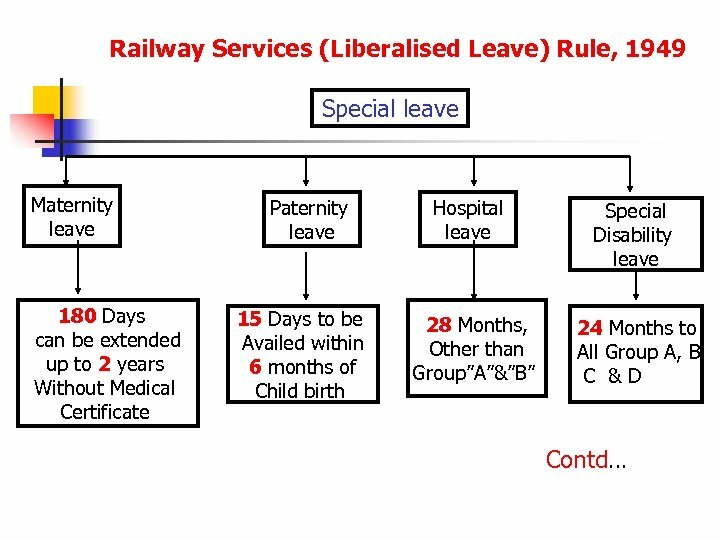 PATERNITY LEAVE A male Railway servant (including an apprentice) with less than two surviving children may be granted paternity leave for a period of 15 days during the confinement of his wife. 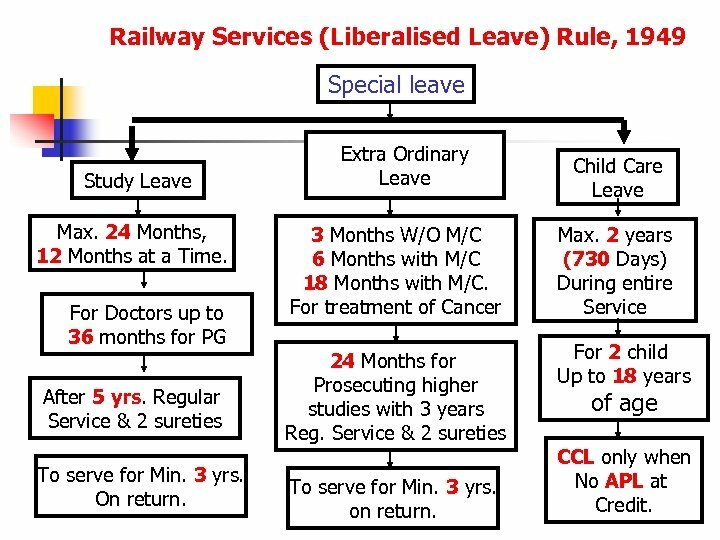 This leave may be granted 15 days before child birth and upto six months thereafter. 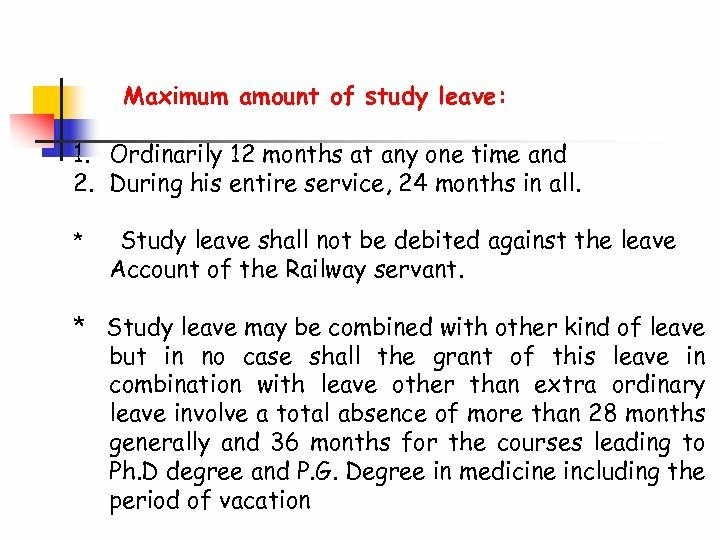 STUDY LEAVE This leave is granted when there is : a) direct and close connection with the sphere of his duties; b) it is likely to improve his abilities as Railway servant; c) it is advantageous to Government from the point of view of public interest and related to the duties of Railway servant; d) it is liberally granted particularly to doctors, scientific & technical staff. 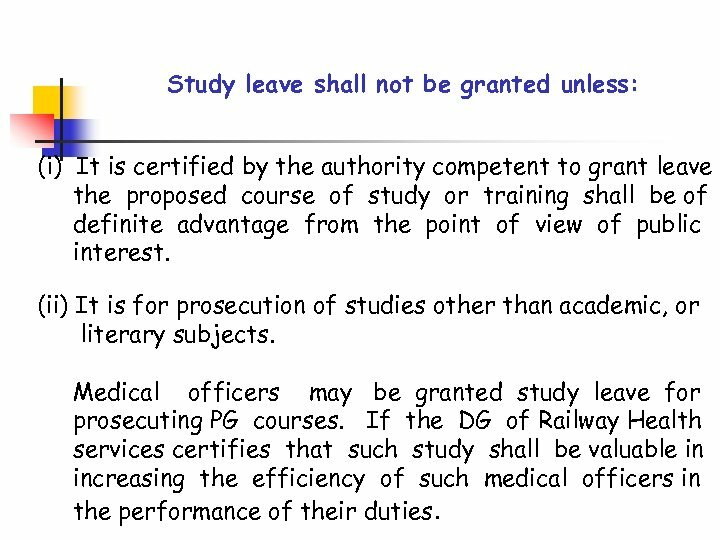 Study leave shall not be granted unless: (i) It is certified by the authority competent to grant leave the proposed course of study or training shall be of definite advantage from the point of view of public interest. (ii) It is for prosecution of studies other than academic, or literary subjects. Medical officers may be granted study leave for prosecuting PG courses. If the DG of Railway Health services certifies that such study shall be valuable in increasing the efficiency of such medical officers in the performance of their duties. 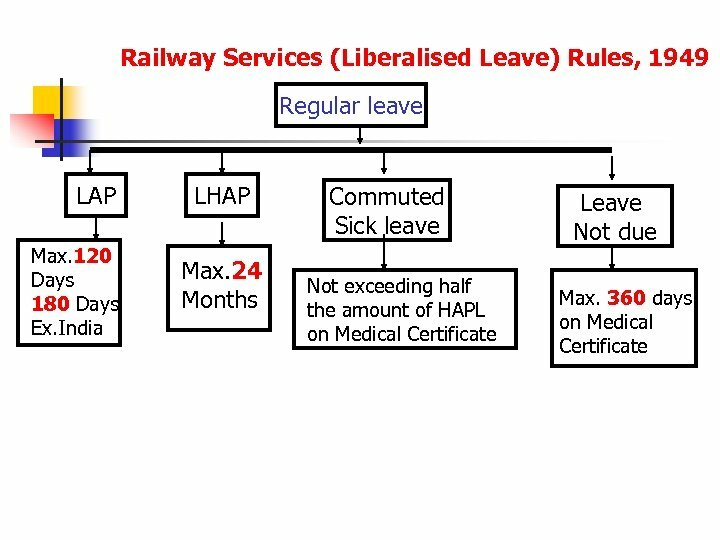 HOSPITAL LEAVE Hospital leave is granted to all classes of Railway servants (except gazetted officers) when they are under medical treatment for injuries sustained on duty. The fact that the injuries were the result of carelessness on the part of the employee is immaterial. 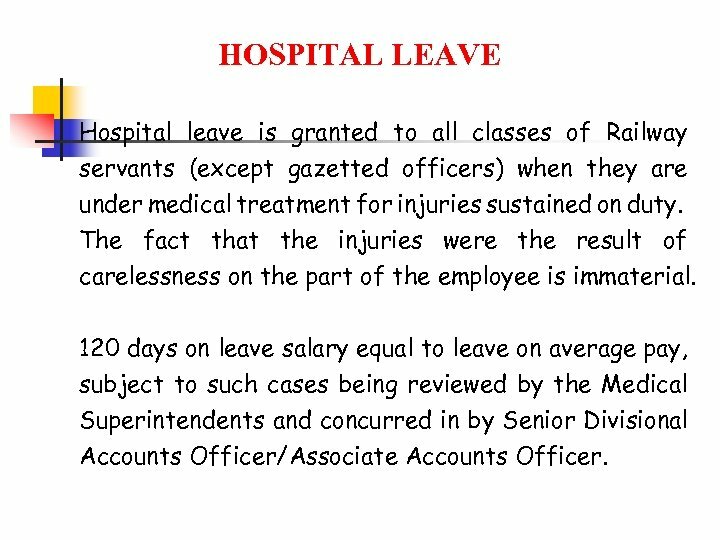 120 days on leave salary equal to leave on average pay, subject to such cases being reviewed by the Medical Superintendents and concurred in by Senior Divisional Accounts Officer/Associate Accounts Officer. HOSPITAL LEAVE ………. . Contd. 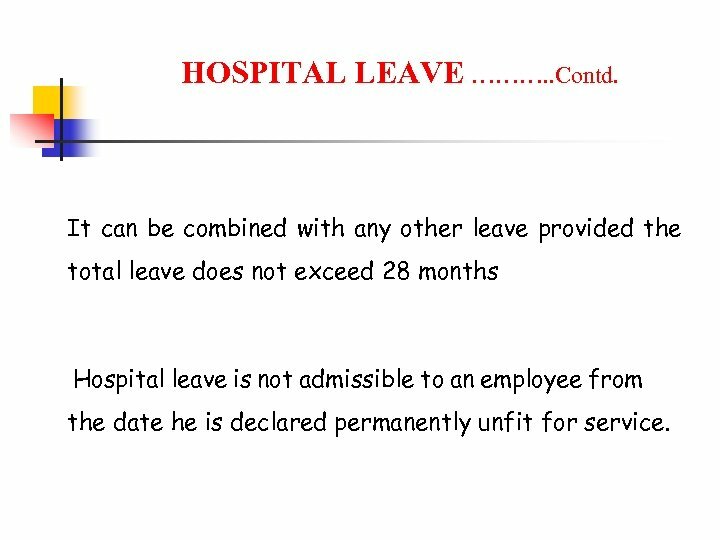 It can be combined with any other leave provided the total leave does not exceed 28 months Hospital leave is not admissible to an employee from the date he is declared permanently unfit for service. 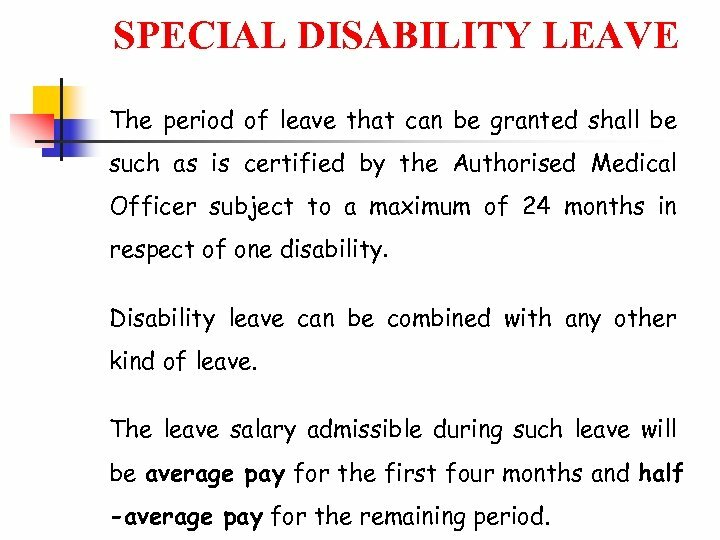 SPECIAL DISABILITY LEAVE The period of leave that can be granted shall be such as is certified by the Authorised Medical Officer subject to a maximum of 24 months in respect of one disability. Disability leave can be combined with any other kind of leave. The leave salary admissible during such leave will be average pay for the first four months and half -average pay for the remaining period. 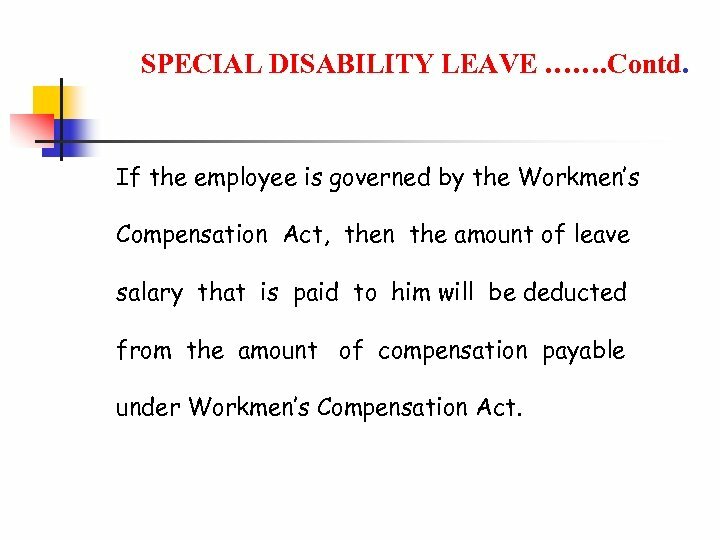 SPECIAL DISABILITY LEAVE ……. Contd. If the employee is governed by the Workmen’s Compensation Act, then the amount of leave salary that is paid to him will be deducted from the amount of compensation payable under Workmen’s Compensation Act. 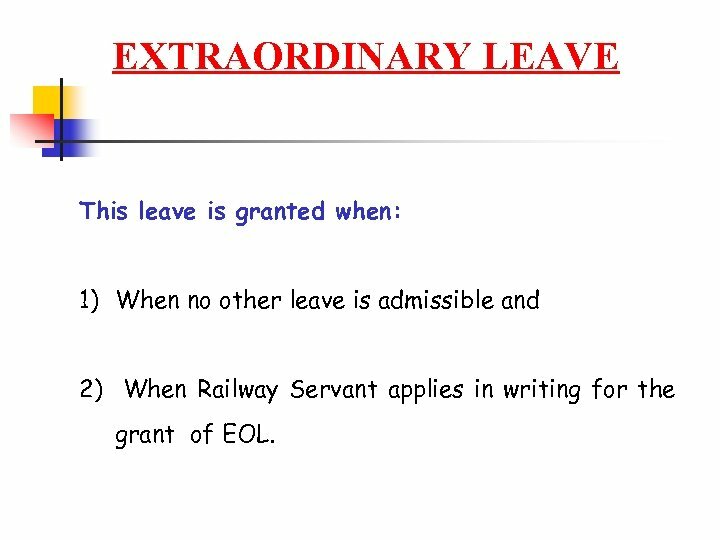 EXTRAORDINARY LEAVE This leave is granted when: 1) When no other leave is admissible and 2) When Railway Servant applies in writing for the grant of EOL. 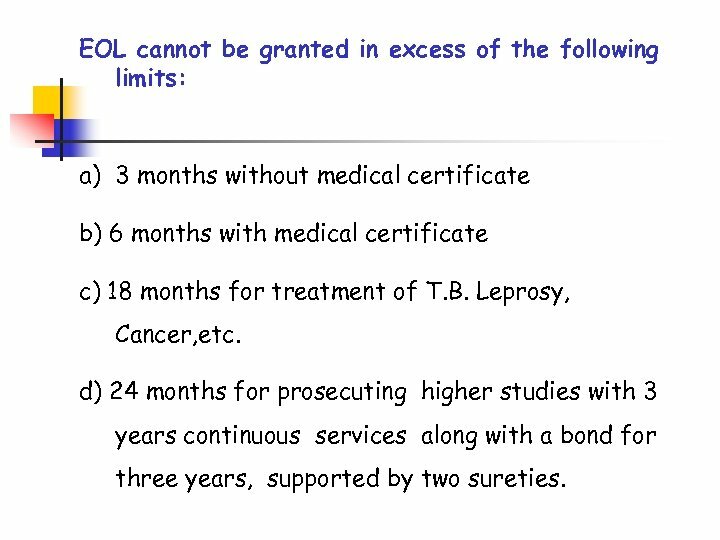 EOL cannot be granted in excess of the following limits: a) 3 months without medical certificate b) 6 months with medical certificate c) 18 months for treatment of T. B. Leprosy, Cancer, etc. d) 24 months for prosecuting higher studies with 3 years continuous services along with a bond for three years, supported by two sureties. Para 547 of Indian Railways Medical Manual (VOL. 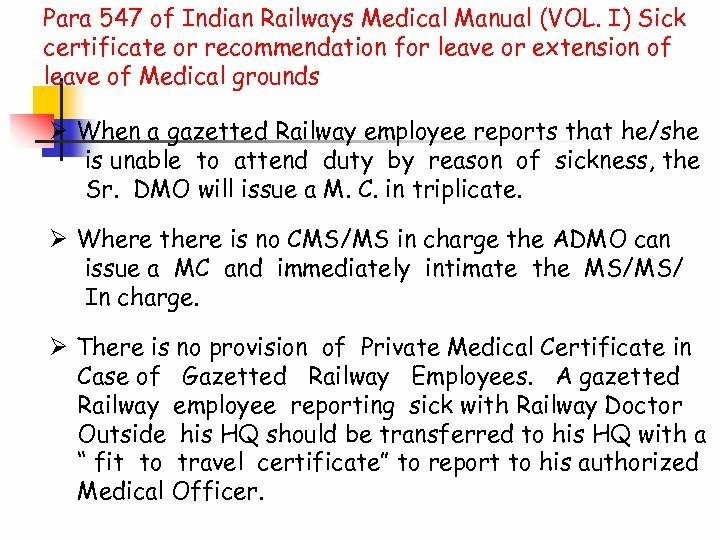 I) Sick certificate or recommendation for leave or extension of leave of Medical grounds Ø When a gazetted Railway employee reports that he/she is unable to attend duty by reason of sickness, the Sr. DMO will issue a M. C. in triplicate. 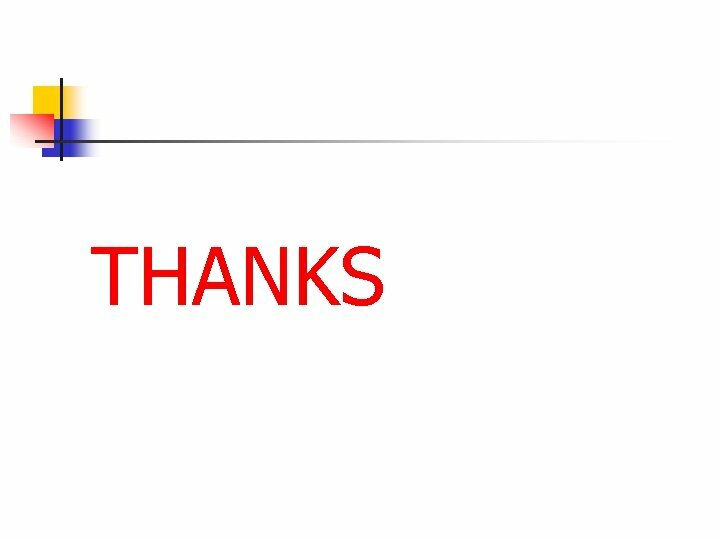 Ø Where there is no CMS/MS in charge the ADMO can issue a MC and immediately intimate the MS/MS/ In charge. Ø There is no provision of Private Medical Certificate in Case of Gazetted Railway Employees. 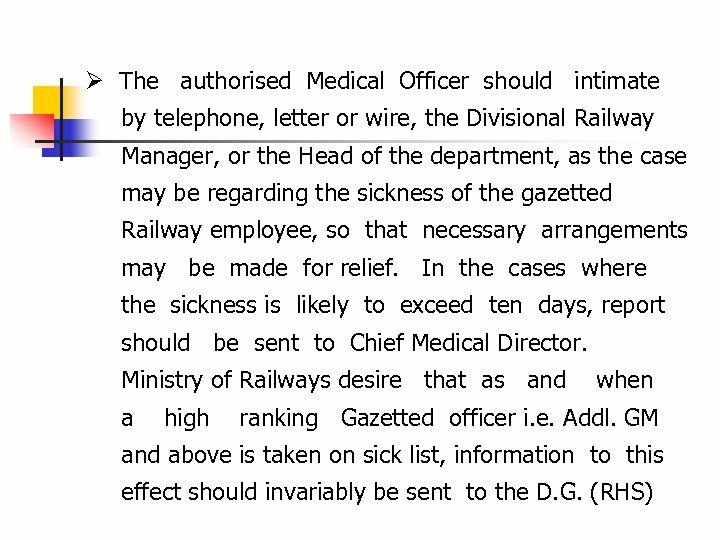 A gazetted Railway employee reporting sick with Railway Doctor Outside his HQ should be transferred to his HQ with a “ fit to travel certificate” to report to his authorized Medical Officer. Probationers of Organized Railway Services appearing in Subsequent Recruitment Examination(s) vz. Civil Services Examination etc. (Rly. Bd’s letter NO. E(Trg)98(19)/2 dtd. 09. 06) In supersession to the instructions issued vide this office letter of even number Dated 28. 8. 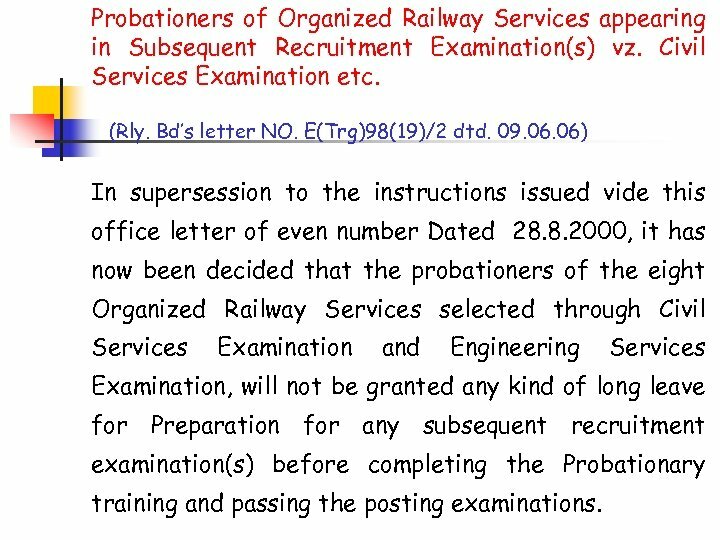 2000, it has now been decided that the probationers of the eight Organized Railway Services selected through Civil Services Examination and Engineering Services Examination, will not be granted any kind of long leave for Preparation for any subsequent recruitment examination(s) before completing the Probationary training and passing the posting examinations.